The small navigation system on my bicycle stopped working properly. But it was not just because I was getting close to the Polish border, that thing was really out of order. Well, there is nothing wrong with finding my way by following road signs, but maybe with a navigation system or a better map I probably would have a taken another road. This way I ended up on a seemling endless straight road through a plantation of pines only along the edge of the Jänschwalde pit mining. In regular intervals signs remind passengers that it is not allowed to leave the road because you would enter premises of the pit mining. On a bicycle the road felt endless, so wenn I finally got out of the pine plantations the landscape around Kerkwitz, Grabko and Atterwasch with iths green pastures and small forests, cows and farms appeared downright picturesque to me. 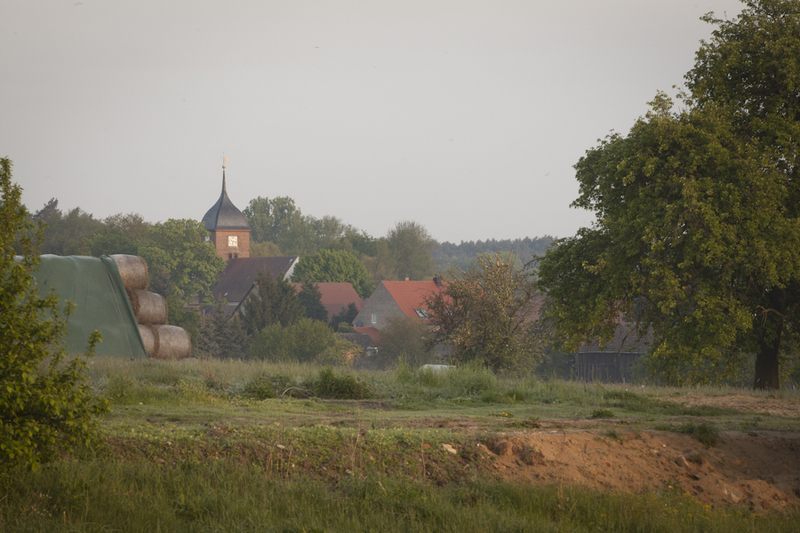 One of the farms is the Schulz Farm in Atterwasch. 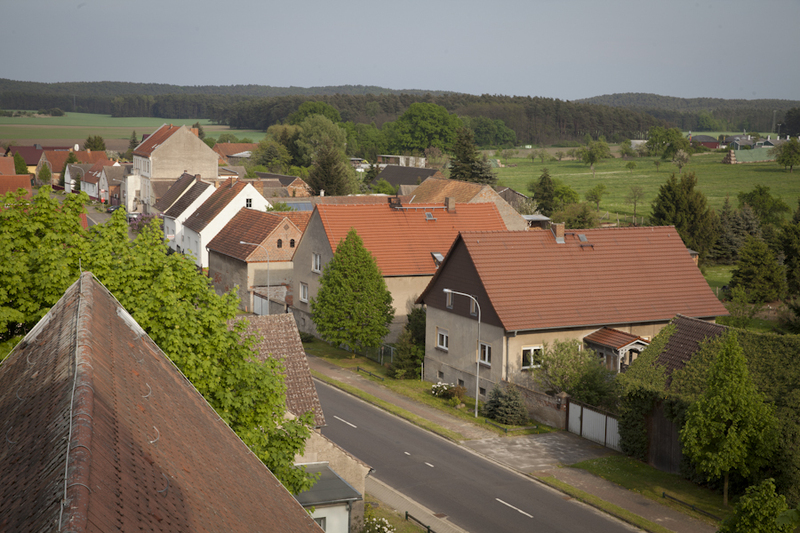 Ulrich Schulz, his son Christoph and their employees work on an agricultural holding with broiler, cattle and pig fattening, a biogas plant, photovoltaic systems on the roofs, a slaughterhouse and a butcher shop during the winter month, as well as farming cropland, grassland and forests. „Farming and producing renewable energies go together 100 percent“, says Ulrich Schulz, „the biogas plant integrates naturally into this agricultural holding. 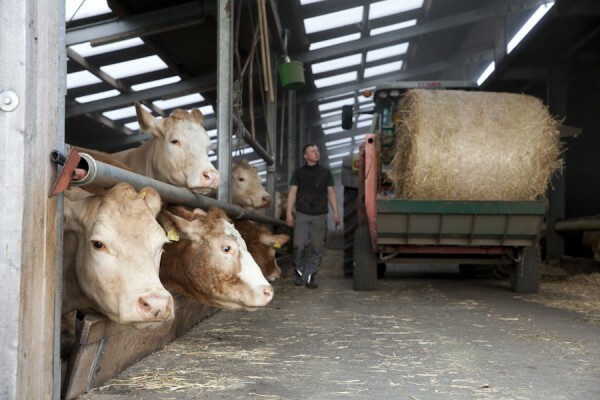 We don’t just use the input from agriculture, that is the manure and renewable raw materials, but we also use the heat for our stables, for our homes and for our commercial premises. 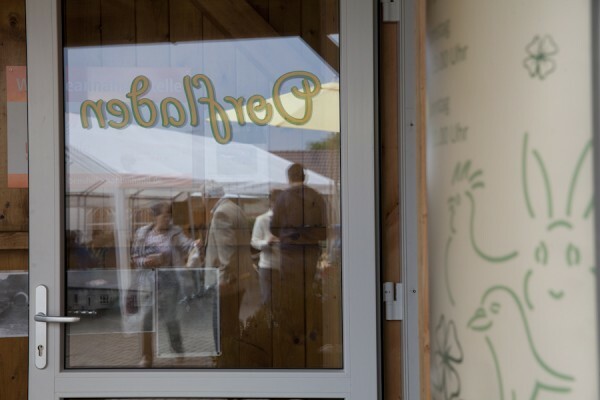 With a biogas plant of the capacity of 3 to 3,5 million kWh per year the Schulz Farm produces what about 1000 average households matematically need, and that is more than the people and small companies in Atterwasch, Kerkwitz and Grabko with their 900 inhabitants are using. „Sure we want to earn money from it, wie have to earn money. 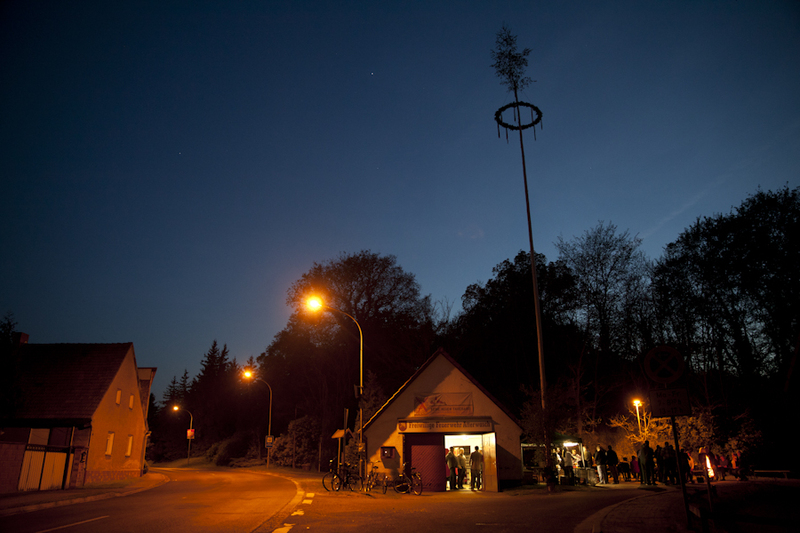 However at the same time we want to show that energy can bei produced in a way that does not demolish, relocate and wipe of the mapp villages,“ Ulrich Schulz explains. Four generations live on the Schulz Farm. Antje Walter, who iis Christoph Schulz’ partner, has painted the room of their little daughter. Things like that imposes the question what is worth doing if you don’t know whether or not you can stay. That’s all well and good that they will pay for wallpaper in your new house, but this was my energy and my ideas, that I put into this“, says Antje Walter about the new houses that the Vattenfall company offers to the people who already agree to relocate. Just talking is not enough. Monika Schulz-Höpfner wants to build up a large alliance between the government, the unions and the different social players to promote the energy transition with a broad consensus. She is worried about the more and more aggressive confrontation between workers of the coal mines, who fear to loose their jobs, and residents of the villages affected, who don’t know whether they will loose their homes. Matthias Berndt has been a pastor in Atterwasch for almost 40 years. „As a pastor my task is to mediate between the disagreeing sides and to try to find a forward-looking solution. Forward-looking means that it has to be a solution that we all can live with. If one’s home is demolished he can’t live there anymore and has to move elsewhere. If one looses his or her job, they can’t live with that either and have to move“, the priest decribes. The church appointed him a special task for pastoral care in the area where brown coal is mined to advocate for the awareness that integrity of creation is a Christian task. To cope with stressful situation like this people also need to be able to put the open pit mining issue aside sometimes and not thing about it. At celebrations like when they set up the maypole and at the village fair there is an agreement to avoid the subject, which works more or less well. This avoidance ot the of the issue is probably necessary to get through the difficult situation as a community and as an individual person. At the opening of the new village shop in Kerkwitz the issue was also excluded to a large extend although the prime minister of Brandenburg came for a visit. 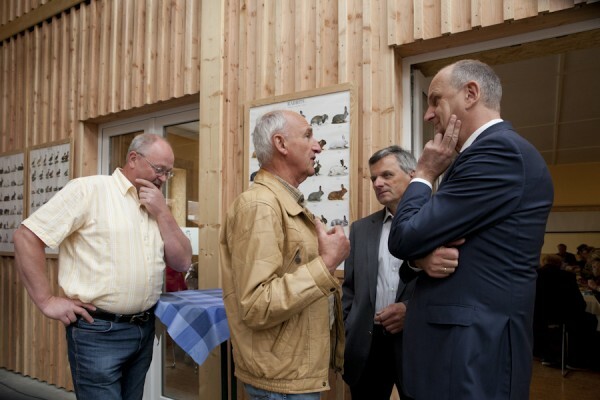 It can probably be seen as a good sign that the prime minister of Brandenburg Dietmar Woidke visited the launch of a village shop in Kerkwitz on May 1st and wished it to exist for many years and decades.